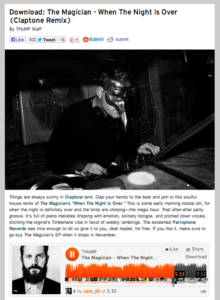 Things are always sunny in Claptone land. Clap your hands to the beat and jam to this soulful house remix of The Magician’s “When The Night Is Over.” This is some early morning rootop ish, for when the night is definitely over and the birds are chirping—the magic hour. That after-after party groove. It’s full of piano melodies dripping with emotion, skittery bongos, and pitched down vocals, ditching the orginal’s Timberlake vibe in favor of wobbly ramblings. The esteemed Parlophone Records was nice enough to let us give it to you, dear reader, for free. If you like it, make sure to go buy The Magician’s EP when it drops in November.